State-transition diagrams are very useful for describing the behaviour of a system and are part of the Software Design Document. Any system where you get a different output for the same input, depending on what has happened before, is a finite state system. For example,if you request to withdraw $100 from a bank ATM, you may be given cash. Later when you make the same request you could be refused money (because your balance is insufficient). This later refusal is because the state of your bank account has changed from having sufficient funds to insufficient funds. And the transaction that caused your account to change its state was probably the earlier withdrawal. 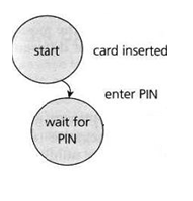 The figure shows an example of entering a Personal Identity Number (PIN) to a bank account. The states are shown as circles, the transitions as lines with arrows and the events as the text near the transitions. P.S: the picture has been taken from the internet. Not all events have an effect in all states. Where an event does not gave an effect on a given state, it is usually omitted , but it can shown as an arrow starting from the state and returning to the same state to indicate that no transition takes place; this is sometimes known as ‘null’ transition or an ‘invalid transition’. 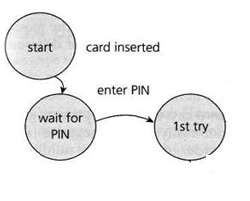 The state diagram shows seven states but only four possible events (Card inserted, Enter PIN, PIN OK and PIN not OK). Actions : (not shown in the above example) could be : Messages on the screen – error or otherwise. In deriving test cases, we may start with a typical scenario. First test case here would be the normal situation, where the correct PIN is entered the first time. A second test (to visit every state) would be to enter an incorrect PIN each time, so that the system eats the card. A third test we can do where the PIN was incorrect the first time but OK the second time, and another test where the PIN was correct on the third try. Or Test cases can be derived with sequences. The smallest “sequence” is one transition at a time. The second smallest sequence is a sequence of 2 transitions in a row and so on. You could also test a series of transitions through more than one state. The coverage element for state transition testing is measurable for different lengths of transition sequences for eg. all single transitions covered, all double covered, all triple covered etc. This is measured with Chow’s n-switch coverage where n= sequential transitions -1. As is obvious, the State Transition diagram only shows the valid transitions between the states. (all transitions not shown are considered invalid). And this is a limitation of deriving test cases from a State Transition Diagram. In order to see the total number of combinations of states and transitions, both valid and invalid, a State Table can be used. A state table is a matrix showing the relationships between all states and events, and resulting states and outputs. The state table lists all the states down one side of the table and all the events that cause transitions on the top (or vice versa). Each cell represents a state-event pair. The content of each cell indicates which state the system will move into when the corresponding event occurs in that state. This will include possible negative or error events – events that are not expected to happen in certain states. These are the negative test conditions. We generate test cases by stepping through the ST. Each row/column intersection is a test case. Invalid or Null Transitions are represented as ‘-‘ in red in the table above. Null or Invalid transitions are when the event has no effect on a state. We have put a ‘dash’ in the cells that should be impossible i.e. they represent invalid transitions from that state. Most of the invalid cells would be physically impossible in this case! State transition testing is much used within the embedded software industry and technical automation in general. However, the technique is also suitable for modelling a business object having specific states or testing screen-dialogue flows (e.g.for internet applications or business scenarios).